This card is must in your deck. Always handy to have a portrait of Sean Connery in your deck for when the odds stacked against you! Sometimes...I forget this card exists. I did not even know that this card existed until a year after I started playing. I'm sorry but this card officially wins my most forgettable hearthstone card award thought it was from GVG it so bad havent seen it in about 2 years not even in arena which i play quite frequently but on the bright side this cards finally the best at something being the most forgettable. i just got 2 golden ones out of a pack. seems decent. oh i've been here before... where am i? He is SUCH a Harold. how did u manage to comment on almost every card!! It's worth mentioning that this card is in a 10-mana 30 damage burn combination. 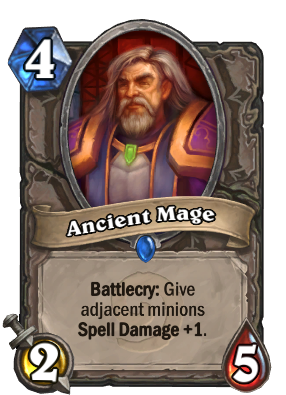 8 mana to play 2 Sorcerer's Apprentice plus Ancient Mage, then burn down 30 with 2 Frostbolt, 2 Ice Lance and 1 Fireball by only 2 mana. That would be (5+6)*2+8 = 30. Although it seems impractical to gather an 8-card combo, it's still a viable plan in a freeze Mage deck where Alexstrasza is a must. Against Priest or Paladin this is a more secured winning strategy than betting on Alexstrasza, considering how easy it is for this two class to stay above 21 after being set to 15. BTW 21 is 4+5*2+7, the classic +1 spell damage burn combination where Druid can't survive after Alex. After the Naxxramas launch, Loatheb evicts most freeze Mage. But freeze Mage has become viable again since the Buzzard & Leeroy nerfs, simply because most decks lost Leeroy burst and are drastically slower now. Yeah you can't give taunt to a minion that already has taunt. But taunt is not the same as spell power. Taunt is like an ability, so how would it stack even if you could stack it? Spell power CAN be stacked because it's just a numerical stat. Proof: I just played a game where I played a Kobold Geomancer then put Ancient Mage adjacent to it. My frostbolt card went from 3 damage to *5*. Sadly this card don't seem to give minions that already have +1 spell power an additional spell power bonus.